Odense City Hall exploded in a spectacular and magical 3D light show that thrilled thousands of visitors during H.C. Andersen Festivals. Panasonic played a crucial role in the fairy tale. "To travel is to live," said the father of fairy tales, Hans Christian Andersen. Thousands of visitors to the Danish city Odense experienced just that when they were taken on an adventurous journey into the popular writer's universe on a summer evening in 2014. 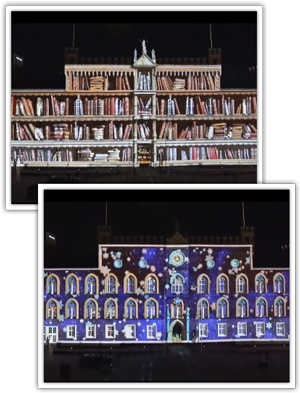 With Odense City Hall used as background, professional light artists delivered a spectacular 3D light show that transformed the town hall into an explosion of colourful and dancing characters from Hans Christian Andersen's fairy tales. The event took place during the annual HC Andersen Festivals in the author's birthplace. Approximately 12,000 spectators at each show met the Little Match Girl, the king's daughter who fell in love with Clumsy Hans, the Steadfast Tin Soldier and many other characters from the popular writer's fairy tales. They danced across the Town Hall, accompanied by beautiful classical music and realistic sound and light effects. "HC Andersen had an imagination like no one else and a strong desire to express himself creatively. So when HC Andersen Festivals asked us to do a light show for the festival, it was obvious that these traits were reflected in our show," says the Lithuanian-Danish artist Nojus Sabalis from We Create Magic. In a 3D animation show the artist produces the light show to fit the specific building's unique architecture, which is transformed into a screen. With the use of large projectors, the show is projected onto the buildings walls without any distortion. Although they live a quiet life in the wings, the projectors from Panasonic play an important role in making the light show a unique experience for the expectant crowd. "The projectors are the alpha and omega of a 3D light show like this. Without a proper projector we could not create such a spectacular experience for the audience," says Nojus Sabalis, stressing that the most important thing is to have a projector that is reliable and delivers razor sharp images. "We have chosen to use two of Panasonic's 20K projectors because they deliver super sharp images and are incredibly easy to work with when doing 3D mapping," says Nojus Sabalis. "When the show is on, we can relax because Panasonic's 20K projectors are running on a total of four lamps, so if one of the lamps goes off during the show nothing happens," says Nojus Sabalis. Normally a projector in this class weighs around 120-150 kg, but Panasonic's 20K projector with the name PT-DZ21K weighs only 43 kg. It is a great advantage when the artists have to place it on top of big buildings. "When we make 3D light shows, the projector must often stand up on the building's roof. Panasonic's projector is so small and handy that two men can easily carry it. It means a lot that we can place it on the roof where we want it. Despite its size, it is just as good as the big projectors from the competitors," says Nojus Sabalis. With Panasonic's projectors we reduce the time spent on adapting the projector to the building with about 50 percent, compared to when we work with competitors. This is because the interface that is integrated into the machines is incredibly easy to use. Panasonic's projector plays a crucial role in making the magic happen during our 3D shows. HC Andersen Festivals is a week of cultural and festive events to raise awareness of the Danish city Odense both nationally and internationally through HC Andersen's universe. Hans Christian Andersen made fantasy without equal and had a strong desire to express himself creatively. It is these characteristics that are reflected in HC Andersen Festivals, which brings adventure, fantasy, and wonder to Odense. 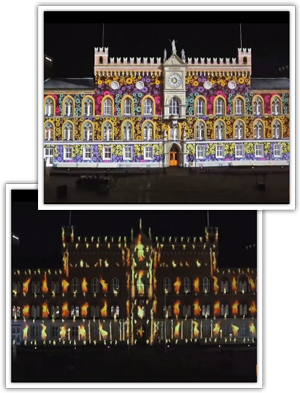 One of the greatest experiences is the impressive 3D light show at the Odense City Hall by We Create Magic. In 2014 the show was so popular that the festival had to make extra performances. A total of approximately 100,000 spectators had the pleasure of a wonderfull 3D journey into HC Andersen's universe. PT-DZ21K is Panasonic's flagship model for professionals. It has previously been used for high profile displays at Berlin Festival of Lights in 2012, the London 2012 Olympic Games and Roger Waters' The Wall Live tour.